I am often asked if our unique approach can help a child struggling with ear infections. Whether the question is coming from a parent who has heard about the success of other kids at Thrive (like this story) or from someone who is simply at the end of their rope looking for options other than drugs and surgery, we have to start by clearing up misinformation and understanding the root cause. With that knowledge, it’s easy to see that pediatric chiropractic care can make the world of a difference for a child with ear infections! This statement is the most common misunderstanding that we see. 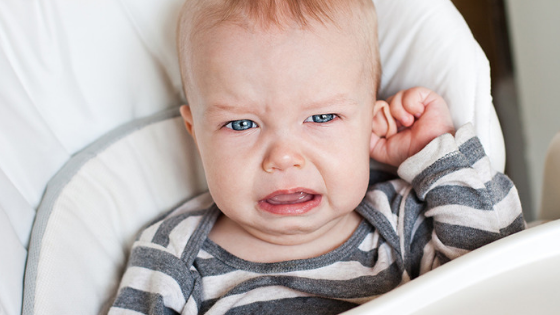 Parents are often told that since the eustachian tubes in kids are more horizontal than they are in adults, the chronic ear infections simply can’t be avoided. This logic quickly falls apart when we consider that, if this were true, all kids would always have ear infections… since they all have horizontal tubes. The reality is that gravity does not play a large role in the drainage of fluid – it’s about movement. Their tubes aren’t hollow like a drainpipe that will simply dump fluid in whichever direction it’s tilted, it’s a muscular tunnel that is collapsed inward. The fluid drains through a movement called peristalsis, which is a wave-like contraction of the muscle. Imagine it as as if you were squeezing the toothpaste out of the tube from one side towards the other! Since it is movement and the muscular contraction of the tube that causes fluid to drain, anything that disturbs proper movement and creates abnormal tension on the eustachian tubes will be an issue. This leads me to the role of the birth process – specifically birth trauma and injury. We could spend hours discussing how birth is typically handled in the U.S. and what you can do to have a better outcome, but that’s been done elsewhere (check out this Baby Bumps & Beyond webinar) so let’s stick to the topic at hand. Long story short, when we intervene in the birth process – when mom and baby’s natural hormonal systems and instincts are no longer calling the shots – there are negative consequences. Many births involve overly forceful contractions (often due to pitocin and an epidural) as well as the doctor or midwife’s hands pulling on the baby’s head and neck area. This sometimes involves even more than the hands pulling on and rotating the head, with forceps or vacuum-extraction being utilized. We all know that a newborn’s head and neck are fragile, as we thoroughly support these areas when holding a little one, but overlook the intense force that often accompanies birth. These significant pulling and rotational forces damage the upper part of the neck, the area surrounding the spinal cord and brainstem. The joints in the top of the spine become misaligned and fixated, affecting both the surrounding tissues as well as the nervous system. Remember the previous discussion about the importance of movement in eustachian tube drainage? The misalignment and fixation of these joints creates abnormal tension on the muscles surrounding the eustachian tube, leading to their inability to drain. When the fluid gets stuck in the tubes instead of draining it becomes the perfect breeding ground for viral or bacterial infections. Not only is the plumbing system of the ears negatively affected by this stress at the top part of the neck, but the neuroimmune system is impacted as well. Areas that control our immune system (such as the vagus nerve) are housed in this area of the brain and spinal cord. This combination of a weakened immune system and poor plumbing makes it no surprise that so many kids deal with recurring ear infections. The topic of antibiotic usage has to be at least briefly mentioned in a discussion on ear infections. While they are frequently prescribed for complaints of ear discomfort, this isn’t necessarily the best option. The American Academy of Pediatrics encourages a “watch and wait” approach in most circumstances, as antibiotics have both short term (wrecking microbiome/probiotic balance in the body) and long term (creation of highly mutated ‘super germs’) negative consequences. When considering the fact that many ear infections are viral in nature rather than bacterial, the rampant use of antibiotics for their treatment seems even more misguided. So, do children struggling with ear infections see great results from pediatric chiropractic care? Absolutely, all the time. We could go on and on with stories that demonstrate this, like that of my own son, who has never had an ear infection in his 2+ years of life. Or Eli, who had monthly ear infections and was about to get tubes before starting care in our office but now has gone 18+ months without one. Does this mean that chiropractic is a treatment for ear infections? No, not at all. It’s simply that when the spine and nervous system shift outside of their normal range it will lead to numerous secondary conditions (such as ear infections), and when those obstructions to normal function are restored, the body can work as it is supposed to. Want to know if our unique approach can help you or your child? Reach out to schedule a complimentary consultation, which is truly a conversation, not a commitment. Awesome information. Thank you for sharing!